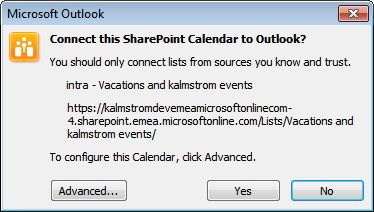 Follow the steps below if you wish to have your SharePoint Task list, Calendar or Contacts in Outlook also. The items are synchronized automatically. Open the SharePoint task list, calendar or contacts in Internet Explorer or Mozilla Firefox. 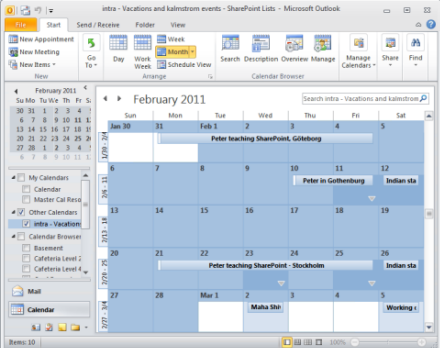 In the images below we show how to connect the calendar, but the process is the same for tasks and contacts. 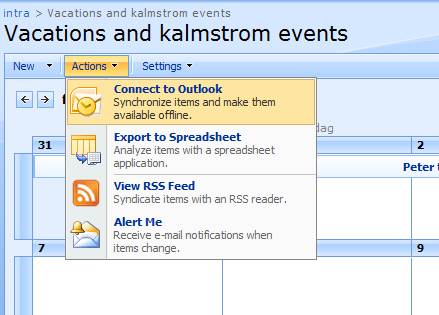 Open the Actions menu and select Connect to Outlook for IE, Connect to Client for FF. Answer Yes to the security warnings. 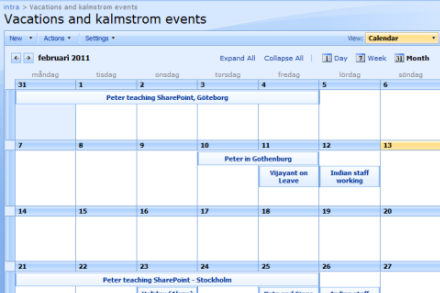 Now you have the SharePoint calendar in your Outlook. Any changes you make will be updated in both calendars when you are connected to the intranet.